The high rate of propagation and easy availability of water hyacinth has made it a renewable carbon source for biofuel production. The present study was undertaken to screen the feasibility of using water hyacinth's hemicelluloses as a substrate for alcohol production by microbial fermentation using mono and co-cultures of Trichoderma reesei and Fusarium oxysporum with Pichia stipitis. In separate hydrolysis and fermentation (SHF), the alkali pretreated water hyacinth biomass was saccharified by crude fungal enzymes of T. reesei, F. oxysporum and then fermented by P. stipitis. In simultaneous saccharification and fermentation (SSF), the saccharification and fermentation was carried out simultaneously at optimized conditions using mono and co-cultures of selected fungal strains. Finally, the ethanol production kinetics were analyzed by appropriate methods. The higher crystalline index (66.7%) and the Fourier transform infrared (FTIR) spectra showed that the lime pretreatment possibly increased the availability of cellulose and hemicelluloses for enzymatic conversion. In SSF, the co-culture fermentation using T. reesei and P. stipitis was found to be promising with a higher yield of ethanol (0.411 g g−1) at 60 h. The additional yield comparable with the monocultures was due to the xylanolytic activity of P. stipitis which ferments pentose sugars into ethanol. In SHF, the pretreatment followed by crude enzymatic hydrolysis and fermentation resulted in a significantly lesser yield of ethanol (0.344 g g−1) at 96 h.
It is evident from the study that the higher ethanol production was attained in a shorter period in the co-culture system containing T. reesei and the xylose fermenting yeast P. stipitis. SSF of pretreated water hyacinth biomass (WHB) with P. stipitis instead of traditional yeast is found to be an effective biofuel production process. The global depletion of fossil fuels that are the dominant sources for supplying cheap energy for the world's economy has prompted recent significant research efforts in finding viable and sustainable alternatives . Among various options, conversion of abundant lignocellulosic biomass to biofuels has received significant attention. Currently, bioethanol production from corn and sugarcane has posed a threat to the food supply , and the cost of these raw materials accounts for up to 40% to 70% of the production cost . Lignocellulosic biomass serves as a cheap and abundant feedstock , which has the potential to produce low-cost bioethanol at a large scale. In recent days, screening of such substrates for biofuel has gained new speed and still there are many factors to be taken into consideration for the large scale production. The performance of enzymatic saccharification is one of the foremost limiting factors which may strongly be dependent on the diverse species, complex chemical compositions, and structural characteristics of the feedstock materials. The sugar yields from enzymatic hydrolysis vary from plant to plant as a result of the differences mainly in cellulose content . Like cellulose, hemicellulose is also a viable source of fermentable sugars such as xylose for biorefining applications. It was suggested that the production of fuel-grade ethanol from xylose requires a microorganism capable of producing 50 to 60 g/L ethanol within 36 h with a yield of at least 0.4 g ethanol per gram of sugar . But only few xylose-fermenting microorganisms have been reported earlier , and it is generally known that Pichia stipitis is superior to all other yeast species for ethanol production from xylose. Water hyacinth (Eichhornia crassipes) is a fast growing perennial aquatic weed invasively distributed throughout the world. This tropical plant can cause infestations over large areas of water resources and consequently leads to series of problems like reduction of biodiversity, blockage of rivers and drainage system, depletion of dissolved oxygen, and alteration on water chemistry that leads to severe environmental pollution. In the past, attempts have been geared towards the use of biological, chemical, and mechanical approaches for preventing the spread of, or eradication of, water hyacinth. On the other hand, much attention has been focused on the potentials and constrains of using water hyacinth for a variety of applications since it has a lignocellulosic composition of 48% hemicelluloses, 18% cellulose, and 3.5% lignin ,. Since the biomass productivity of this plant is very high, it can be a suitable feedstock for ethanol production. The technologies for the possible conversion of water hyacinth to biogas or fuel ethanol using fungal extracellular enzymes are well documented in a number of developing countries -. Saccharomyces cerevisiae and Zymomonas mobilis are being used as candidate organisms in the large-scale production of ethanol from cellulosic biomass. These organisms are capable of utilizing hexose sugars efficiently but not the pentoses, which are the second dominant sugar source in lignocellulosic biomass . From earlier research, P. stipitis has been identified as an efficient strain for the conversion of pentose sugars into alcohol . Fermentation technologies utilizing strains of P. stipitis instead of traditional yeast have been proposed by a number of authors ,, as they have been shown to ferment under fully anaerobic conditions with faster specific rates of pentose sugar uptake and ethanol production as well as an ethanol yield close to theoretical yield. The present study, therefore, was carried out to screen the feasibility of using hexose- and pentose-utilizing fungal strains (Trichoderma reesei, Fusarium oxysporum, and Pichia stipitis) for the effective conversion of water hyacinth biomass into ethanol. Fresh water hyacinth biomass (WHB) was collected from a local pond at Karaikudi, Tamilnadu, India (10.07°N, 78.78°E). The collected samples were washed to remove adhering dirt, cut into small piece (2 or 3 mm) thicknesses, and dried in sunlight. The proximate analysis for biomass was done using standard methods for moisture content, ash, crude protein, crude fibre, cellulose, hemicelluloses, and lignin ,. The fungal strains of T. reesei and F. oxysporum were isolated by primary selection from a naturally contaminated water hyacinth, and the isolates were confirmed by their morphology and colony characteristics . The isolated organisms were maintained on modified potato dextrose agar (PDA) slants at 4°C. Fresh colonies were used for saccharification and fermentation studies. The pure culture of P. stipitis (NCIM 3497) was procured from the National Collection of Industrial Microorganisms, Pune, India. The dried WHB (10% w/v) was pretreated with calcium hydroxide solution (0.5% w/v) with a soaking time of 3 h at 100°C. The pretreated WHB washed to neutrality with distilled water, oven dried to a constant weight, and then milled to powder was used for enzymatic hydrolysis and fermentation . Two modes of bioconversion methodologies for ethanol production were trialed in the present study. Mode I comprised of a separate hydrolysis and fermentation (SHF) process using crude fungal enzymes with yeast. Mode II was designed to conduct a simultaneous saccharification and fermentation (SSF) process using mono and co-cultures of selected fungal strains. Enzymatic hydrolysis was carried out by incubating the pretreated WHB (10% w/v) with the crude fungal enzymes (10% (v/v)) of T. reesei and F. oxysporum separately at 35°C for 48 h with agitation at 200 rpm . The pH of the reaction mixture (6.0) was maintained at constant. Samples were aliquoted from hydrolysates at a regular interval (24 and 48 h) to estimate the released sugar content using standard methods ,. The hydrolysates obtained after 48 h from both the fungal cultures were centrifuged at 10,000 rpm for 10 min. The supernatants were collected separately and supplemented with basal medium (1 g L−1 yeast extract; 2 g L−1 (NH4)SO4; 1 g L−1 MgSO4•7H2O) (pH 6.0) . The culture suspension of P. stipitis (10% v/v) was added to initiate the fermentation by incubating the mixture at 35°C for 48 h with agitation at 200 rpm. For monoculture experiments (F1 and F2), previously sterilized (121°C for 60 min) pretreated WHB supplemented with a basal medium (without C source) was inoculated with late log-phase cultures of T. reesei (F1) and F. oxysporum (F2), separately. For co-culture fermentation (F3 and F4), separate sets of reaction mixtures consisting of pretreated WHB supplemented with basal medium were treated with P. stipitis simultaneously with T. reesei (F3) and F. oxysporum (F4). The fermentation process was carried out at optimized conditions. The results obtained were analyzed by using analysis of variance (ANOVA), and the group means were compared with Duncan's Multiple Range Test (DMRT) . Fourier transform infrared spectra were studied on treated and untreated WHB using a Shimadzu spectrometer (Shimadzu, Kyoto, Japan). For this, 3.0 mg of the sample was dispersed in 300 mg of spectroscopic grade KBr and subsequently pressed into disks at 10 MPa for 3 min. The spectra were obtained with an average of 25 scans and a resolution of 4 cm−1 in the range of 4,000 to 400 cm−1. where I002 is the intensity of the diffraction from the 002 plane at 2θ = 22.6° and Iam is the intensity of the background scatter measured at 2θ = 18.7°. It is known that the I002 peak corresponds to the crystalline fraction and the Iam peak corresponds to the amorphous fraction . The lignocellulosic biomass composition of WH includes cellulose (20.2 g 100 g−1 dry matter (DM)), hemicellulose (34.3 g 100 g−1 DM), lignin (4.4 g 100 g−1 DM ), crude protein (13.3 g 100 g−1 DM), crude fibre (18.2 g 100 g−1 DM), and ash (15.4 g 100 g−1 DM) (Table 1). The results obtained in the present study on the proximate composition of WHB are basically consistent with previous literatures ,,. The digestibility of lignocelluloses is hindered by many physicochemical, structural, and compositional factors which required a suitable pretreatment in order to enhance the susceptibility of biomass for hydrolysis. It is highly essential for the economical production of ethanol that both the cellulose and hemicellulosic sugars present in the biomass should be utilized efficiently. The FTIR and XRD data in the present study clearly suggested that the pretreatment with lime could increase the availability of polysaccharide for enzymatic hydrolysis. Among different pretreatment methods used in earlier researches for water hyacinth, maximum reducing sugar was observed in diluted H2SO4 (0.342 g g−1 biomass) , HCl (0.277 g g−1 biomass), acetic acid (0.097 g g−1 biomass), and formic acid (0.088 g g−1 biomass) ,. In comparison with the above reports, it is evident that the lime pretreatment used in the present study is a promising method for higher sugar yield. The pretreatment with Ca(OH)2 is preferable because it is less expensive, more safe as compared to NaOH, and it can be easily recovered from the hydrolysate by reaction with CO2. Lime has been used to pretreat many lignocellulosic materials such as wheat straw , poplar wood , and corn stover . Cellulose crystallinity, usually measured as CrI, is considered an important parameter determining the enzymatic hydrolysis susceptibility of cellulose. The CrI of a cellulose sample is an indication of the degree of formed crystallinity in the sample when the cellulose aggregates. The crystallinity has been found to have a greater impact on enzymatic hydrolysis than other structural characteristics such as the degree of polymerization (DP) of cellulose or the specific surface area (SSA) . The XRD profile of WHB indicated that the CrI of untreated WHB is 28.6% and alkali-treated WHB is 66.7% (Figure 1). The X-ray diffractogram clearly revealed that the lime pretreatment increased the crystallinity of cellulose in water hyacinth. Similar results were reported earlier by Kim and Holtzapple  who found that the degree of crystallinity of corn stover slightly increased from 43% to 60% through delignification with calcium hydroxide and by Li et al. who have reported high cellulose CrI of 70.6% in Metasequoia chips by nitric acid-ethanol method. The increase in CrI of alkali-treated WHB might be due to the removal of amorphous components including lignin during the pretreatment process ,. According to Satyanagalakshmi et al. , the amorphous cellulose portions in aquatic plants are more prone to recrystallization to form crystalline cellulose, resulting in greater increases in CrI. XRD analysis of untreated and lime pretreated WHB. FTIR spectra of the untreated and treated samples indicated structural changes in the biomass upon pretreatment (Figure 2). The increased absorption bands at 1,000 to 1,200 cm−1 were related to structural features of cellulose and hemicelluloses . 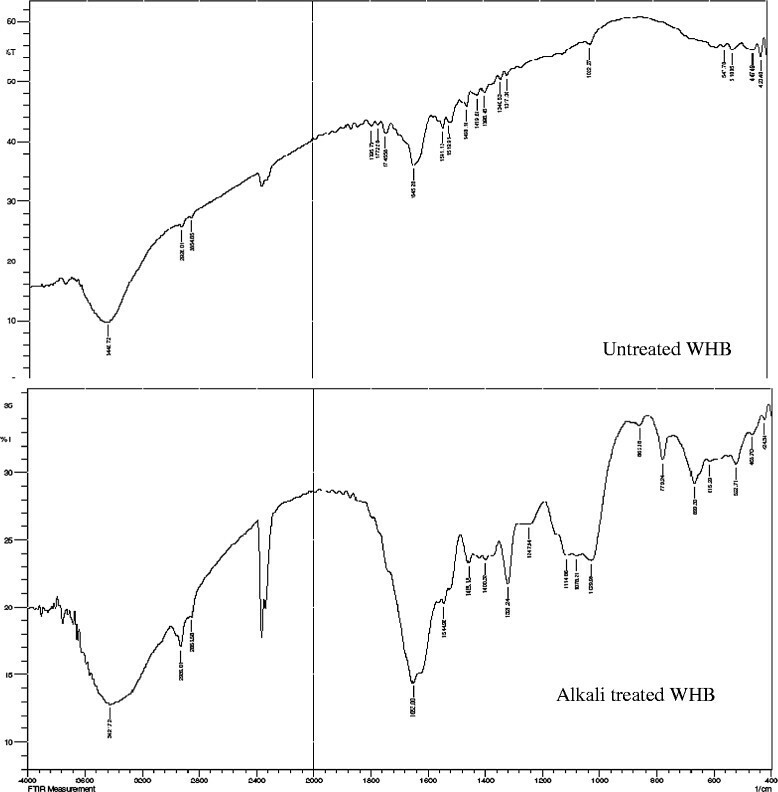 The spectra of alkali-treated WHB sample (Figure 3) showed increase in absorbance in the above-mentioned range. The peak at 1,635 cm−1 was observed due to either the acetyl and uronic ester linkage of carboxylic group of the ferulic and p-coumeric acids of lignin and/or hemicelluloses . A sharp band at 896 cm−1, corresponding to the C1 group frequency or ring frequency, was attributed to the glycosidic linkages between xylose units in hemicelluloses . The peaks in the pretreated sample had the highest absorbance suggesting increase in cellulose and hemicellulose content. In the FTIR spectrum, the peaks observed at 1,092 and 842 cm−1 were attributed to C-O stretching and C-H rocking vibration of the cellulose structure. 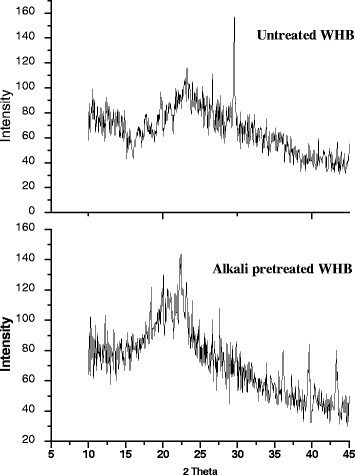 FTIR spectra of untreated and alkali (Ca (OH) 2 )-treated WHB. Effect of fermentation period on ethanol yield from pretreated WHB using mono and co-cultures. F1, T. reesei; F2, F. oxysporum; F3, T. reesei + P. stipitis; F4, F. oxysporum + P. stipitis. In recent decades, the use of fungi in bioprocesses has grown in importance because of the production of numerous enzymes with different biochemical properties and excellent potential for biotechnological application. The cellulase and xylanase activities reached their maximum values on the 6th day of incubation for both the fungal isolates. Cellulase production on WHB with nutrient supplements indicated higher cellulase production by T. reesei (0.923 IU/mL) compared to F. oxysporum (0.432 IU/mL). However, it is less than the value of 1.35 IU/mL reported by Deshpande et al. on the substrate water hyacinth with Toyama-Ogawa medium . The xylanase production was slight, but significantly higher in F. oxysporum (0.764 IU/mL), compared to T. reesei (0.611 IU/mL). According to Kang et al. , high xylanase production in some fungi has been shown to be linked strictly to the ratio of cellulose to xylan of the growth substrate and substrate degradation due to time course or incubation period. According to Polizeli et al. , filamentous fungi are widely utilized as enzyme producers and are generally considered more potent xylanase producers than bacteria or yeast. Several mesophilic fungal species have been evaluated in relation to xylanase production, including members of Aspergillus, Trichoderma, and Penicillium. Currently, most commercial xylanolytic preparations are produced by genetically modified Trichoderma or Aspergillus strains . The yield of sugars from enzymatic hydrolysis of WHB using crude enzymes produced by fungal isolates was summarized in Table 2. The saccharification was significantly higher (40.8%) while using crude enzyme from T. reesei when compared to F. oxysporum (38.2%). The release of total sugars by the crude enzymes of both monocultures increased slowly to reach a peak value at 48 h of incubation. The maximum yield of total sugar (0.531 g g−1 WHB) including glucose (0.444 g g−1 WHB) and xylose (0.057 g g−1 WHB) was observed after 48 h of hydrolysis using crude enzymes of T. reesei. The crude enzymes obtained from F. oxysporum produced comparably lower reducing sugar (0.428 g g−1 WHB) and xylose (0.038 g g−1 WHB). Thus, it substantiates that the amount of sugar released increases with time which may be due to the increased action of cellulolytic and xylanolytic enzymes of T. reesei and F. oxysporum. The cellulolytic fungus T. reesei looks promising for on-site cellulase production due to its superior features, i.e., capability to produce all components of cellulase complex, endocellulase, exocellulase, and β-glucosidase in good proportions as well as production of other enzymes such as xylanases or laccases in comparison to other enzyme producers . Values are the mean of three replicates ± SE. Means followed by the same letter within treatment do not differ significantly (p = 0.05). The optimization studies in SSF showed that the yield of ethanol is found to be proportional to fermentation time where the yield increases with the increase in time up to 60 h and then declines (Figure 3). Maximum yield of ethanol is 0.413, 0.378, 0.194, and 0.187 g g−1 of WHB at 60 h of fermentation for F3, F4, F1, and F2, respectively. After 60 h of time, the yield of ethanol decreases in all treatments, and therefore, fermentation time of 60 h is taken as the optimum time for ethanol fermentation. With the increase in temperature, the yield of ethanol increased up to 35°C and then it decreased (Figure 4). At high temperature (>35°C), death rate exceeds the growth rate, which causes a net decrease in concentration of viable fungal populations with lower generation of ethanol. With the increase in loading of biomass, the yield of ethanol increased up to 10% and then decreased in all the samples (Figure 5). The decrease in ethanol yield with the increase in biomass loading can be attributed to the inhibitory effect of either the product or the biomass. Inhibitory compounds limit efficient utilization of hydrolysates by the fermenting organism resulting in less ethanol production . 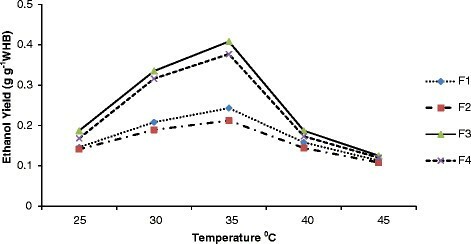 Effect of temperature on ethanol yield from pretreated WHB using mono and co-cultures. F1, T. reesei; F2 F. oxysporum; F3 T. reesei + P. stipitis; F4, F. oxysporum + P. stipitis. Effect of microbial biomass on ethanol yield from pretreated WHB using mono and co-cultures. F1, T. reesei; F2, F. oxysporum; F3, T. reesei + P. stipitis; F4, F. oxysporum + P. stipitis. In the SHF process, a maximum of 14.3 g L−1 ethanol was produced at the end of the process (96 h) which is equivalent to 0.143 g g−1 WHB (Table 3). The minimum production of ethanol observed in the submerged fermentation of pretreated water hyacinth biomass using monocultures of T. reesei and F. oxysporum was due to the inability of these organisms to convert pentose sugars into ethanol. A similar finding was reported earlier where 0.11 g ethanol was obtained from alkali-pretreated water hyacinth through SHF . According to Preez et al. P. stipitis is known to produce ethanol up to 33 to 57 g/L; however, 30 g/L is known as a critical concentration above which cells cannot grow at 30°C. Ec, ethanol concentration (g L−1); Ep, ethanol productivity (g L−1 h−1); Ey, ethanol yield (g g−1 WHB); Esy, specific ethanol yield (g g−1 sugar); ETE, theoretical yield (g g−1 WHB); S1, hydrolysate from T. reesei; S2, hydrolysate from F. oxysporum. Values are the mean of three replicates ± SE. Mean followed by the same letter within treatment do not differ significantly (p = 0.05). In SSF, monocultures of T. reesei (F1) and F. oxysporum (F2) produced 19.3 and 17.8 g L−1 ethanol, respectively, after 60-h fermentation (Table 4). Simultaneous co-culturing of T. reesei (F3) and F. oxysporum (F4) with P. stipitis resulted in a higher ethanol production (40.8 and 36.8 g L−1, respectively) at the same time. The maximal ethanol yield was 0.411 g g−1 WHB when P. stipitis was used along with T. reesei which is positively correlated to the theoretical yield 0.429 g on the basis of biomass. Since xylose was present as a predominant sugar in the WHB hydrolysate, P. stipitis was used to make the biomass-to-ethanol process more economical. Mishima et al. , on the other hand, reported a lesser ethanol yield of 0.14 g g−1 dry substrate through SSF of pretreated water hyacinth using commercial cellulase and S. cerevisiae. The overall production could be enhanced by co-culture rather than monoculture of test organisms. Similarly, direct microbial conversion of cellulosic or lignocellulosic biomass into ethanol using co-cultures had been reported by several authors ,,. S. cerevisiae or Z. mobilis utilize glucose or sucrose efficiently but their inability to utilize pentose sugars make them inappropriate candidates for refineries, but the candidate organism P. stipitis used in the present study showed efficient conversion of pentose sugars into alcohol. Among the pentose-fermenting organisms, P. stipitis has been shown to have the most promise for industrial applications . Earlier reports showed that the hemicellulosic hydrolysates of Prosopis juliflora (18.24 g sugar/L broth) when fermented with P. stipitis produced 7.13 g/L ethanol . Kuhad et al. observed 0.33 g g−1 ethanol yield from detoxified xylose-rich hydrolysate of Lantana camara fermented with P. stipitis at pH 5 for 36 h. Similarly, the detoxified water hyacinth hemicellulose acid hydrolysate (rich in pentose sugars) fermented with P. stipitis NCIM-3497 at pH 6.0 and 30°C resulted in 0.425 g ethanol/g lignocelluloses . The yield of ethanol per unit biomass of water hyacinth obtained through the bioprocess in the present study was comparable to or even better than those reported earlier. The current results clearly demonstrated the saccharification potential of T. reesei and F. oxysporum, where the performance of both strains in co-cultures with P. stipitis was significantly higher than their respective single culture. Ec, ethanol concentration (g L−1); Ep, ethanol productivity (g L−1 h−1); Ey, ethanol yield (g g−1 WHB); Esy, specific ethanol yield (g g−1 sugar). Values are the mean of three replicates ± SE. Mean followed by the same letter within treatment do not differ significantly (p = 0.05). All the co-culture processes reached a higher value of microbial biomass than the single fermentation process. A maximum of 3.12 g DCW L−1 biomass content was obtained in the co-culture of T. reesei and P. stipitis at 60-h fermentation (Table 4). Inoculation of P. stipitis with F. oxysporum resulted in a biomass content of 2.64 g DCW L−1 over the monocultures. Statistically, a less significant difference was observed with monoculture's fermentation when compared with co-culture . The fermentation of bioethanol from pretreated water hyacinth biomass with mono and co-cultures of fungal strains along with P. stipitis is found to be an effective biofuel production process. The yield of ethanol recovered from WHB through enzymatic hydrolysis and fermentation from simultaneous inoculation of co-cultures of fungal isolates with P. stipitis was significantly higher than that recovered through monocultures. The optimum parameters for bioethanol fermentation are as follows: time 60 h, temperature 35°C, and WHB loading 100 g L−1. The maximum yield of ethanol in the fermentation process was found to be 0.411 g g−1 of WHB which is equivalent to a specific yield of 0.456 g g−1 total sugar consumed. The use of crude fungal enzymes produced on-site would be a cost-effective approach towards enzymatic hydrolysis of alkali-pretreated WHB biomass instead of using commercial cellulases. The aquatic menace water hyacinth, which is currently being used in waste water treatment for its unique ability to absorb heavy metal pollutants, could also be utilized as abundant cheap feedstock for the production of fuel ethanol. This study proved that water hyacinth has a potential renewable and low-cost biomass for alcohol production on the commercial scale. Present cost effectiveness of respective process at a commercial scale needs to be standardized, and the water hyacinth biomass could be a better substrate source for alcohol production. The authors are thankful to all faculty members of the PG and Research Department of Botany, Alagappa Government Arts College (Alagappa University), Karaikudi. We also acknowledge the Head, Department of physics, Alagappa University, Karaikudi and the Department of Chemistry, VHNSN College, Virudhunagar, Tamilnadu for helping us with XRD and FTIR analysis, respectively. CP carried out the submerged fermentation processes and helped design the whole study. RA carried out proximate analysis of biomass and helped in manuscript preparation. RMG helped in characterization of biomass using FTIR and XRD. All authors read and approved the final manuscript.